There’s a lot of Canadian enthusiasm for digging around the Holy Land! Concordia Lutheran Seminary’s (CLS) QUEST extension course on archaeology and Jesus began Tuesday, October 11 and, for the first time, attracted large online participation. Fitting all the material into two-hour sessions is not easy, but Dr. Chambers covered five of his “top ten” topics of biblical archaeology in the first session. 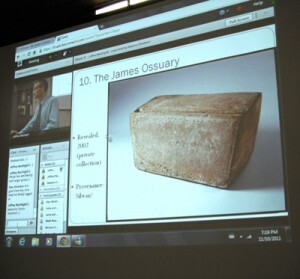 Students saw photos and learned about the ossuaries (burial chests) of James and Caiphas; the Pilate inscription; Yehohanan the crucified man; and the Herodian cities of Caesarea Martima and Jerusalem. The online group in Saskatoon. Marion Hollinger takes the course online with nine fellow parishioners at St. Paul’s Lutheran Church in Saskatoon. “While I’ve read or seen information on some of the items under discussion, Dr. Chambers adds other perspectives from his experience at a dig in Israel and his knowledge of Scripture and history,” she says. “My understanding of the context of Scripture has grown a little in the one session so far and will, I am certain, grow more.” This is her third online QUEST course and she notes that the quality of online delivery has improved immensely. 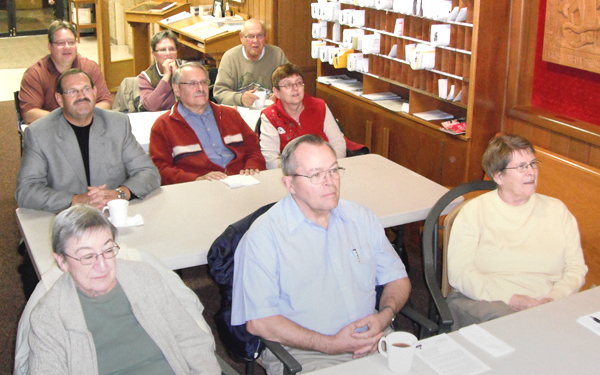 “Everyone seemed quite engaged with the topic,” says St. Paul’s pastor, Rev. Mark Dressler. “We are all looking forward to the next three classes so we can continue our study of this fascinating topic,” he adds. Dr. Chambers says he and technical assistant Jeff Nachtigall spent a considerable amount of time before the first session making sure the webcam, PowerPoint, and chat room would engage online students as well as those in the classroom. Even though the first session has already taken place, it is not too late to register. (The first session is recorded so you can catch up!) Anyone can take part from any location. The cost is $40, but the registration fee is waived for pastors, church workers, and individuals who participate as a group at one site. Dr. Chambers notes the only things missing for online students are the refreshments enjoyed by those in the Edmonton classroom! To register, contact Sandra Esperanza seperanza@concordiasem.ab.ca , or call 780-474-1468. I was one of the people who viewed the first lecture online in Campbell River. Does anyone know if the notes that the professor kept bringing up on Powerpoint will be posted so they can be copied or downloaded?